Your home is a disaster. Spring is here. And you’re as excited about cleaning it now as you were back in October. We see it like this: spring cleaning is like going into battle. To win that battle, you need a game plan…and a little help from Mary Jane to help you power through the boredom of cleaning bathroom grout and organizing your storage closet. Hey, there’s no shame in asking for help. That’s what we’re here for. No more procrastinating. Let’s do this. Here are the 6 best ways to tackle spring cleaning with cannabis! Cleaning your entire home is a huge endeavor. Don’t spend too much time thinking about how you’re going to do it all, or that you have to do it all in one weekend. Instead, make a list. Break everything down into chunks by listing all the different sections of your home that need to be dealt with. Now make another list for each section, detailing all the things you have to do in that particular section. Once you’ve listed your sections and the tasks that have to be done in each one, you’re ready for the next step. For each task you’ve created, figure out which day(s) you’re going to work on it and the amount of time you’re going to spend. To start simply, you can schedule 10 minutes out of each weekday to work on a task. Once you get your 10 minutes done, you can stop and move on to other things for the rest of the day. If you have weekends off, you can schedule longer periods of time, dividing your work hours into 1-hour, 3-hour, or if you’re feeling really ambitious, 8-hour blocks. Ultimately, the amount of time you spend cleaning each day is up to you. Just remember: the more time you’re able to invest in a task, the sooner it’ll get done and the better you’ll feel. Clutter has a demoralizing effect on the soul. Just having to look at it everyday can make you feel like garbage. Which is ironic because that’s exactly where your clutter belongs: the garbage. Research even shows that clutter can raise your stress levels. Luckily, clearing away clutter doesn’t involve any special tools or cleaning equipment. It just involves putting things where they belong or throwing out stuff you no longer need. So before you get to the heavy-duty cleaning, clear away that clutter first. As you’re getting rid of clutter and throwing out unwanted items, you might come across a few things that, even though you don’t want them, other people might be willing to pay for them. Put those sellable items in boxes and set them aside. Once you finish your spring cleaning, have a garage sale and try to unload as many of those items as possible. You’ll not only be creating more space in your home, but you’ll have some extra spending money in your pocket to boot! 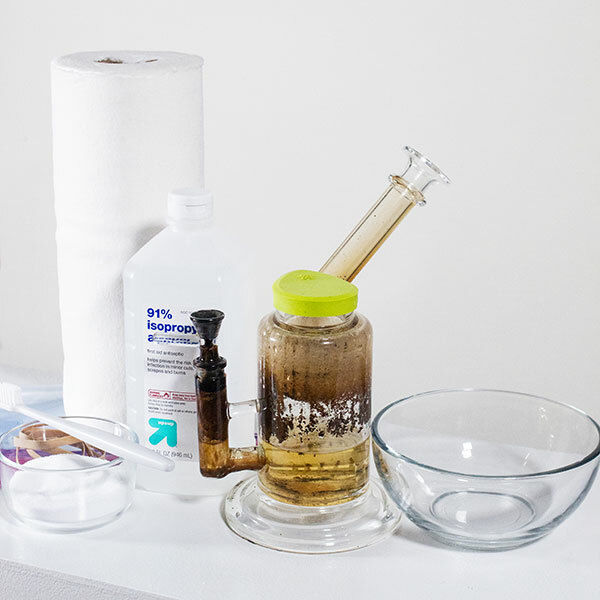 Bowls, bongs, and vaporizers need to be cleaned just like anything else. Seattle Weekly published a great article on cannabis equipment cleaning tips. Here’s a short summary. Place the pipe in a plastic bag or plastic container with a lid. Fill the container with isopropyl alcohol and several tablespoons of salt. Make sure the pipe is totally submerged. GENTLY swish the pipe around in the mixture. Let it soak for 15 minutes, then repeat the swishing motion. Repeat this entire sequence a few times. If your pipe is extra dirty, let it soak overnight. When it’s time, rinse the pipe out completely under hot water. If it’s still dirty, you can use pipe cleaners, Q-tips, and paper towels to remove the remaining bits of resin. Don’t worry about soaking these bigger pieces of equipment. Always change the water after each use. Don’t let it just sit there session after session! Remove the ashes from the bowl by tapping them out. When using a dab, give the dab nail a wipe with a Q-tip after each hit before it cools completely. Use a cotton ball soaked in alcohol to clean the bottom part of the nail that comes in contact with the glass. Not all vape devices are built the same way, so check the company website or the product instruction manual for cleaning instructions. Lemon Meringue #2 is a sativa-dominant hybrid — a cross between Lemon Skunk and Cookies & Cream. This lemon-and-earth scented strain ranks between 18-22% THC, giving you an elevated and focused head effect that will provide you with energy, focus, and drive. Your body will also feel calm and relaxed, helping you stay nice and loose as you plough through the junk pile in your garage. Canna Cubes are a great microdosing option for spring cleaning warriors. These tasty, fruit-flavored, chewy squares contain just 5 mg of THC – just enough to give you the boost you need to get your work done. Miss X is a cross between the CBD-dominant strain ACDC and Mr. X. It comes from our cultivator Green Life Productions, which prides itself on growing organic cannabis. Like Lemon Meringue #2, Miss X is a sativa-dominant hybrid. The difference? Miss X contains 30-34% THC. This strain is perfect for getting you pumped up for a morning weekend full of cleaning activities. And the relaxing body effects will help you stay mellow if you start feeling overwhelmed. Hope you enjoyed our 6 tips on tackling spring cleaning with cannabis! 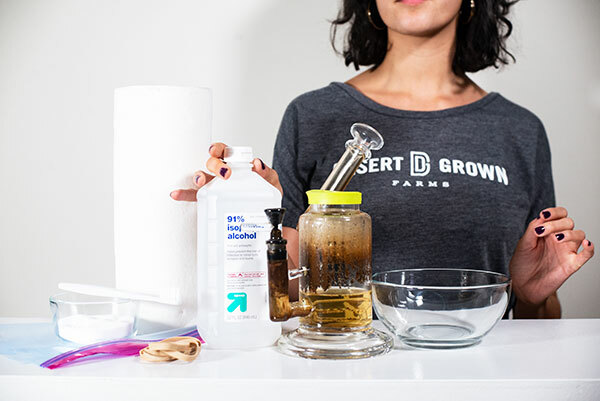 If you’re interested in the products we’ve listed or you want more info on how to properly clean your cannabis equipment, you can contact us at any of our three locations — Las Vegas Strip, Tropicana West, and Henderson — and one of our dispensary consultants can help you out. And as always, you can order Essence cannabis products online for either pick-up or delivery!